Thomas’s mosaic-like abstract canvases reveal her keen powers of observation and interest in natural phenomena. In this painting, Thomas was inspired by hydrangeas and other spring flowers she admired in gardens near her home in Washington, D.C. 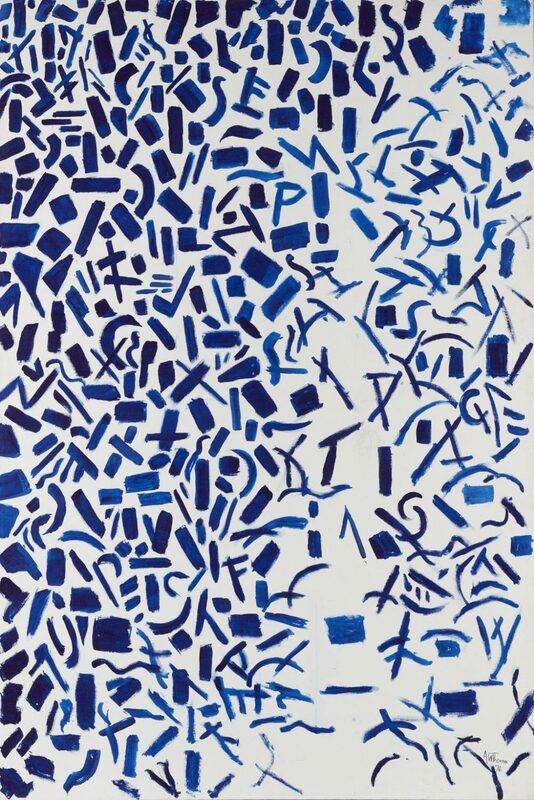 The scattered abstract shapes and letters form a composition that evokes a wide range of associations, from cutout collages by Henri Matisse to African textiles. Alma Thomas was the first woman graduate of Howard University's fledgling art department in 1924. She went on to teach art in a Washington, D.C., junior high school for the next thirty-six years, all the while painting in her spare time. It was during the 1950s that her interest in abstract art blossomed under the tutelage of the New York painter Jacob Kainen, who introduced her to the latest work of the Abstract Expressionists. In 1960, at the age of 69, Thomas finally retired from teaching to devote herself full-time to what she called serious art-making. During the next two decades the artist would produce a series of vibrant canvases, whose shimmering, mosaic-like patterns reveal her study of color theory and sensory perception. A contemporary of the colorfield painters Morris Louis, Gene Davis, and Kenneth Noland, Thomas shared their interest in hard-edged abstraction, while retaining a sense of the rhythms and forms of nature. Hydrangeas Spring Song is a superb example of the artist's accomplished late work, which during the 1970s saw a leap in scale and a renewed sense of joie de vivre. Like many of her large-scale canvases of this time, this intensely lyrical painting was chiefly inspired by natural phenomena, in this case the hydrangeas and other plants and flowers she admired in the gardens near her home. However, the scattered, abstract shapes and letters that form the puzzle-like composition also reference a wide range of sources for the artist's unique pictorial vocabulary, including the late cutout collages of Henri Matisse, Byzantine mosaics, and African textiles. The astonishing achievement of this monumental painting is bolstered by the knowledge that Thomas made it while she was in her eighties and suffering from severe arthritis. It is thus an uplifting image of springtime, in which the newly bloomed hydrangeas are transformed into a towering abstract canvas, whose lyricism celebrates the artist's own joy in the act of painting. Michael Taylor, from Philadelphia Museum of Art: Gifts in Honor of the 125th Anniversary (2002), p. 115.